Sometimes I suspect I fall so in love with an illustrator’s style, that I’ll like anything they do. But with Jeanne Willis you get a number of different illustrators, so I don’t know why I keep falling in love. What I was saying about having picture books read to you, applies to this one as well, because Jeanne read this herself. What could be better? 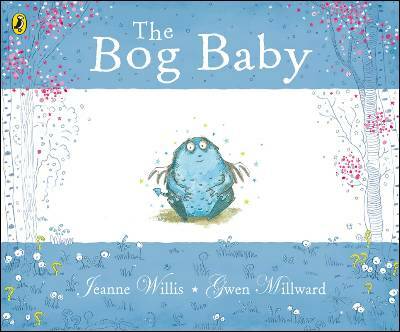 The Bog Baby is her most recent book, and with adorable pictures by Gwen Millward. Bog Babies are round and blue and jelly-like, and they are SO lovable. This story is about loving and learning to let go. I want a Bog Baby! No, that’s not an author, it’s a book title. Meg Rosoff has a new picture book out, and this is not it. Trouble is, not even Meg has a copy of the new one yet, so I’ll go for the old one. 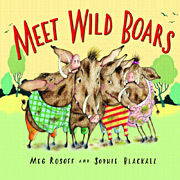 When I bought Meet Wild Boars a couple of years ago, I wasn’t sure what to make of it, until Daughter read it to me. Then it made sense. Well, you know, not sense, but it was as it should be. It’s easy to forget when the children get so old that they don’t have books read to them, that sometimes that is exactly the point of some books. And picture books more than others. So thanks to Daughter I learnt that Wild Boars has to be read out. But not necessarily to a young child. Boris, Morris, Horace and Doris are pretty awful. They’re boars, and I’m guessing invented by or for Meg’s daughter. They have their uses, those girls. The illustrations by Sophie Blackall are not pretty, but intentionally so. The information on the book jacket about Meg and Sophie, is at least as good as the book. And I found one review saying the book was so awful they threw it away. Don’t believe it. Last night Daughter, feeling a bit depressed, started reading Wild Boars to me again. She had forgotten that Meg had signed the book to her, so coming across that very friendly greeting, cheered her up considerably. So to jump to the purpose of having books signed; that could be one. Making the signee happy. in the Guardian today. So if you’re feeling you could be Shakespeare, go in and comment. For the modest, a comment as yourself will do nicely, too. The tale of last Monday’s meeting with Cathy Forde can be found here. Cathy is lovely, and it’s good to meet someone new, to me, that I can like instantly. Don’t know why this matters, but it’s nice. I’ve combined this interview with a brief review of Cathy’s latest book, Sugarcoated. I started reading her Fat Boy Swim while waiting for Cathy to turn up, but she was so early that I got almost no way at all… Looks promising, is all I can say. It seems we are to get age guidance on children’s books. The question is whether this is helpful or not. Some quotes from yesterday’s Guardian Review; “which seven-year-old?” and “it’s not the age that’s important, but who the child is”. True. But if the book says age 7+ and you are buying for an exceedingly clever seven-year-old, you might decide to go for a 10+ instead. And some people are so out of touch with children’s reading, as well as with the child they are buying for, that any guide will be a help. Kind of the book equivalent of remembering that a two-month-old will neither resent the fact that her older brother gets chocolate for Christmas, nor that she won’t be able to make much use of the chocolate buttons offered as being more baby-ish. Some years ago I picked up a very tatty copy of Nina Bawden’s The Witch’s Daughter (how apt!) in the school fair. It was the original Puffin from the sixties, and the reading age was given as 8+. I thought it sounded a bit young, for me, but decided to push on with reading it anyway. Not only is it a good book, but it’s not that easy a read either. I came to the conclusion that an eight-year-old forty years ago was supposed to be more advanced in their reading. Dumbing down. So, consider who gives the advice, and how many decades ago. Then adjust to what your needs are. Jacqueline Wilson has done death before, so I don’t suppose I should say that she seems to have caught the latest death book bug. The cover is very nice, all purple and to my taste. The story even has a witch or two in it, seeing as it covers Halloween. Should have been an autumn book, really. Daughter loved My Sister Jodie, and was most affronted when I said I didn’t, to be quite honest. Maybe it was something about that boarding school, which didn’t feel right. And I’ve never been a fan of Jacqueline’s mothers, but this one really annoyed me. Loved Harley and the badgers. Even quite liked the bad gardener. Contrary, is what I am. I introduced Declan at Crime Always Pays to Sara Paretsky, and he fired off his standard list of questions at her. Sara has now answered and you can find the results over on CAP. He found a great photo of her, too, so go across and have a look.